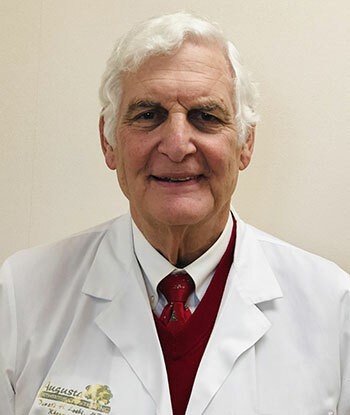 Dr. Loebl, Sr. grew up in Milwaukee where he attended and graduated from Marquette University High School. Following this, he attended Marquette University and Northwestern University Medical School. He obtained his BS in Medicine in 1968 and his MD degree in 1971, both from Northwestern University. He married Dr. Anne M. Loebl, his Dermatology consultant, in 1970. After an Internship at Butterworth Hospital in Grand Rapids, Michigan, he completed an Internal Medicine Residency and his first year of Rheumatology Fellowship at Northwestern University. Active duty with the United States Army followed for 2 years at Fort Gordon, Georgia. He completed his second year of Rheumatology at the Medical College of Georgia in 1978 after which he joined the faculty of MCG from which he retired in 2006. During this time, he served in the United States Army Reserve Medical Corps . He has been in private practice in Augusta since 2006. He is board certified in Internal Medicine and Rheumatology.